The provision of volunteer assistants. The provision of appropriate teaching resources and methods. The establishment of a supportive community, the Sun Mountain Zen Sangha. A committee of elected members who carry out various responsibilities to ensure a harmonious and efficient organisation manages Sun Mountain Zen Inc. They are guided by the teachers of Sun Mountain Zen. 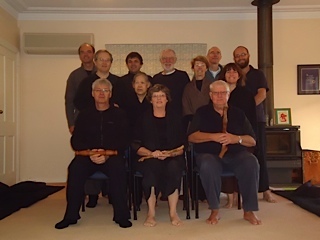 Teachers, Mervyn Lander and Cecilie Lander are dharma successors of Seiun-An, Roselyn Stone Roshi and authorised teachers in the Sanbo-Zen school of Kamakura Japan. Teacher Arno Hess Shûun-Ken is a dharma successor of (Gôun-Ken) Mervyn Lander and an authorised teacher in the Sanbo-Zen school of Kamakura Japan. In 2017 Arno Hess has commenced his own teaching through “Pathway Zen”, separate to Sun Mountain Zen. Sun Mountain Zen is therefore affiliated with the Sanbo – Zen lineage. This is a relatively young Zen school in Japan, which has drawn freely on both Soto and Rinzai traditions. Ordinary Member, defined as being a recognised student of Cecilie Lander, Mervyn Lander, Sue or Glen Wolter and also being a financial member Sun Mountain Zen. Life Member, defined as being a recognised Teacher with Sun Mountain Zen. Honorary, defined as a person who has been voted in as an honorary member by the majority of the committee and endorsed by the teachers of Sun Mountain Zen. Members of Sun Mountain Zen may vote. The committee of Sun Mountain Zen holds regular committee meetings to comply with the Association Incorporations Act. The Annual General Meeting, unless otherwise indicated, is held on the first Zenkai of the New Year, usually in February or March. Please refer to the annual calendar. All members of Sun Mountain Zen are invited to attend and to nominate for the next year’s committee positions. What unites us at Sun Mountain Zen is our commitment to realising and personalising our “true self” in our daily life through the practice of zazen and koan study with our teachers. We do this practice within a supportive community of ‘sitters’ – the Sangha. As members of Sun Mountain Zen, we take this work seriously. We participate as much as we can in the Sangha weekly meditation practice, either in Aspley, East Brisbane, Samford or Kenilworth. We participate as much as we can in the monthly Zenkai (one day sitting), Intensives (weekend sittings) and Mini-Sesshin (a long weekend) and we make every effort to attend the annual 5 or 7 day Sesshin. Members are also asked if able, to participate in the running of the Sangha and Zendo. This is done by assisting in various responsibilities such as setting up and cleaning up the Zendo before and after the sittings or coordinating Sangha events. 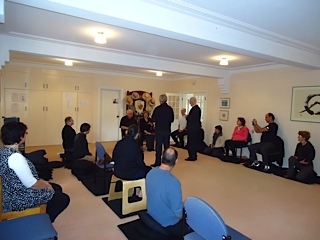 Later on, as participants become well experienced in the practice, they may be asked by the teachers to take on other responsibilities such as Jikido (the time keeper), Ino (the chant conductor), Jisha (teachers assistant during retreats and coordinator of the dokusan line). The position of Tanto (Zendo leader) is used at the longer Intensives and Sesshin and is appointed by the teachers for each event. Please take your responsibilities seriously. One of the many benefits of being a member of Sun Mountain Zen is to be able to participate in the yearly Sesshin. This 5 or 7 day, in-house meditation practice is the highlight of our annual activities. For those who have not participated in a Sesshin, you are in for a treat. While 7 days of meditation and ‘fronting’ up 3 times a day for dokusan is not everyone’s idea of fun, participation is nevertheless one of the most important gifts you can give yourself. Many Zen students only begin to take their practice really seriously after the experience of a Sesshin. This prolonged period of zazen is for most participants an opportunity to fully realise their true nature. Do not miss a Sesshin! The practice of Zen can be described as the practice of mindfulness. Mindfulness is nothing else but consciously living the present moment. It is often said that enlightenment means nothing if it is not lived in the marketplace. At Sun Mountain Zen, the marketplace is our Zendo including all the rituals and practices in which we participate. The marketplace is also every moment of our everyday lives— with family, work and in the wider community. All of these afford a place and time to practice mindfulness. Be on time. I.e. before the sitting ?commences.Allow yourself time to get ready and to settle into your place. Consider coming 20 minutes earlier to help others setup the Zendo. Before entering the Zendo, place your shoes, bags ?etc. neatly in the space provided. Gassho towards the room then towards your cushion / chair. Settle on your cushion. Be ready by the time of the warning clappers and certainly by the first gong. If you need to leave the Zendo, do so during kinhin quietly. Every distraction is a potential interruption to someone’s practice. Walk slowly, quietly and deliberately. Do not make unnecessary noise. Be mindful and considerate. When moving on your cushion or chair, gassho before the move and after the move. This is to be mindful of the potential disturbance you have just created to your neighbor. Sun Mountain Zen Sangha has a number of costs associated with the provision of the services it offers to its members and visitors. Once a year, a budget is established at the AGM, which aims to forecast these costs as well as the income generated by the Sangha. Hall and Venue Hire for our weekly, monthly and yearly events, sponsorship of people unable to pay for Zen events, public Liability Insurance, advertising for introduction days, Internet costs, tea and coffee, cushions, meditation stools, mats, bowls, incense, candles and other instruments used in Zen rituals, printed matter, postage and handling costs, cleaning costs, and reimbursement costs to teachers as agreed annually by the management committee. It should be noted that, at present, the teachers are not paid for their teaching services to the Sangha. They are however reimbursed for some of the costs associated with providing the teachings. Costs should not be a hindrance to our practice. No student will be refused the teachings based on costs. All of the costs associated with Zen practice at Sun Mountain Zen are suggested costs. We aim to sponsor anyone not able to afford an activity related to our practice.